Pure beauty. That’s what these tomatoes are. Pure-brilliant-beauty. I’m not a fan of raw tomatoes. Shocked? Yeah, most people are. It’s a textural thing. Goes right up there with mushrooms and peas. Put a dish in front of me with a few of these roasted, deep-red beauties and it’s another story all-together. I’ve been promising this recipe for close to a year now, and I’m truly sorry it has taken me so long to getting around to photographing these. My excuse is that we eat them after I make them and only after we’re rubbing our bellies and dabbing the corners of our mouths with our high-falutin’ paper napkins, would I realized I’d forgotten to take pictures. Again! Geesh, we chef/food bloggers can be so hard to work with. 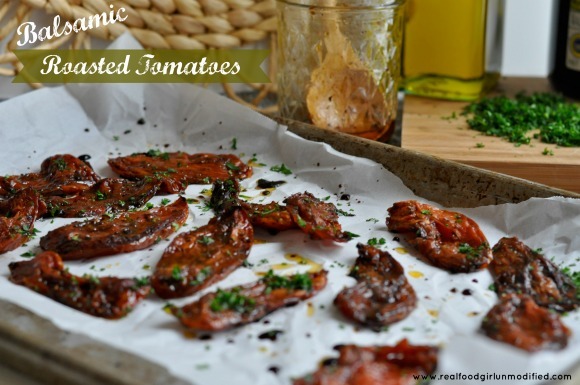 These couldn’t be easier to make and the possibilities for using balsamic roasted tomatoes are endless. Pasta, flatbreads, pizza, sandwiches, eat them cold, put them on some crackers with goat cheese, or on a crostini with some goat cheese and a drizzle of honey. Dice them up and put them in ravioli. You are only limited by your imagination when it comes to these little gems. I’ve seen these made where people take the time to plunge the tomato into boiling water for 30 seconds and loosen the skin, then peel it off. 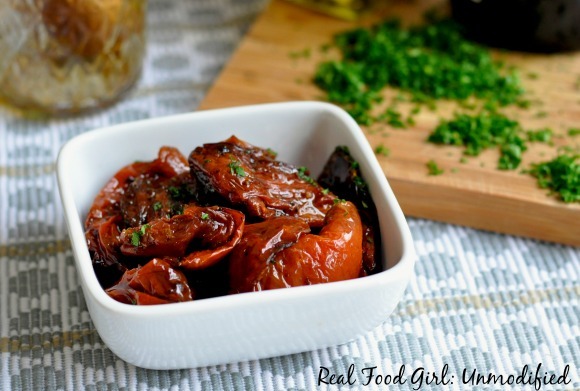 I personally think that the skin adds to the flavor and texture of these balsamic roasted tomatoes and so if you want to take the time to peel the skin off your maters, go right ahead, knock yourself out. I however, do not remove the skin and find that entire step pointless and unnecessary. Aren’t you glad you asked my opinion on the matter? I used organic Roma tomatoes for this recipe. I prefer the Roma to a basic beef-steak or salad tomato. I think they look nicer and have a much more developed flavor once roasted. 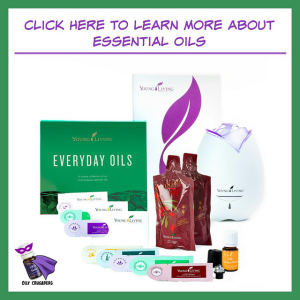 Make sure you have some really good, organic olive oil on hand to pack these in if you aren’t going to eat them right away. I usually stuff the tomatoes into a pint-sized canning jar and drizzle in a little extra balsamic, some freshly chopped rosemary (just a touch) and fill the jar a third of the way with the olive oil and then refrigerate until ready to eat. Bring to room temp before serving or using in a dish, unless you don’t mind digging through some solidified olive oil. Preheat oven to 325 degrees. Gently wash tomatoes in a bowl filled with water and a TB of vinegar. Blot dry with a towel and set aside. With a paring knife, carefully core the top of the tomato. Next, quarter the tomato lengthwise--cut in half lengthwise and then cut each half in half lengthwise. Seed the quarters using your fingers, and pull off any tough/whitish flesh from the tomato. You may also just slice out the center of each quarter with your paring knife. Lay the tomatoes skin side down- flesh side up on a large baking sheet lined with parchment. Sprinkle generously with salt and pepper. About 1 tsp. salt and 1/2 tsp pepper. Next drizzle on the balsamic vinegar over the tomatoes and do the same with the olive oil drizzle as evenly as possible over each tomato. Sprinkle the oregano and parsley over the tomatoes. If using the brown sugar, sprinkle it over the tomatoes at this time. Place tomatoes in your preheated oven and roast for 60 minutes. Halfway through baking, rotate your pan. If the tomatoes start to get too dark, turn the oven down to 315 and continue checking every 10 minutes. They should be a deep, dark reddish color. See my photos for example. 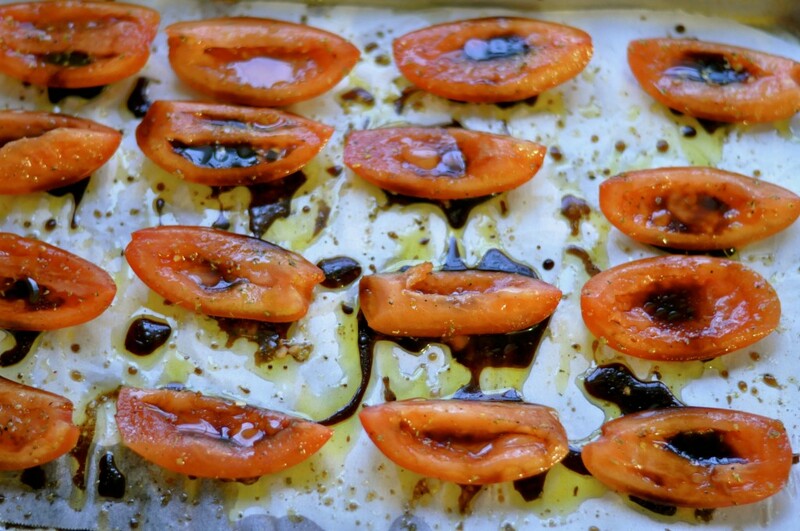 When finished roasting, remove from oven and let the tomatoes cool slightly on the sheet pan before serving, using in a dish, or storing in a canning jar with extra balsamic and olive oil. NOTE- Sometimes I'll add a half tsp. of freshly chopped rosemary to the jar prior to storing these in the fridge. Hi! How long do you think these keep in the fridge submerged in olive oil? Thanks! They normally don’t last longer than a week in our house. 🙂 Hope this helps! These look great. I can’t wait to try it. Is there a way to perserve them? It would help to use up the summer glut of tomatos and add sunshine to a winters day. I am not by any means a canning expert. I’m not even a canning novice. I believe that you should not can anything with oil and there is a fair amount of oil used to roast these. I would maybe research some canning websites to see the best way to can roasted tomatoes and what substitutions you’d need to make to avoid botulism or any other scary bacteria that can happen when you can something improperly or when you can something that shouldn’t be canned. I wish I had more helpful information for you, Sandra. You don’t like raw tomatoes either? I knew you were cool, but that is just to awesome. I make tomatoes similar to this, and love them. But, I think you have taken tomatoes to the next level, and I will be trying this with my tomatoes this year. Ha- yes, I can’t handle raw tomatoes. Icky! Husband thinks I’m crazy. 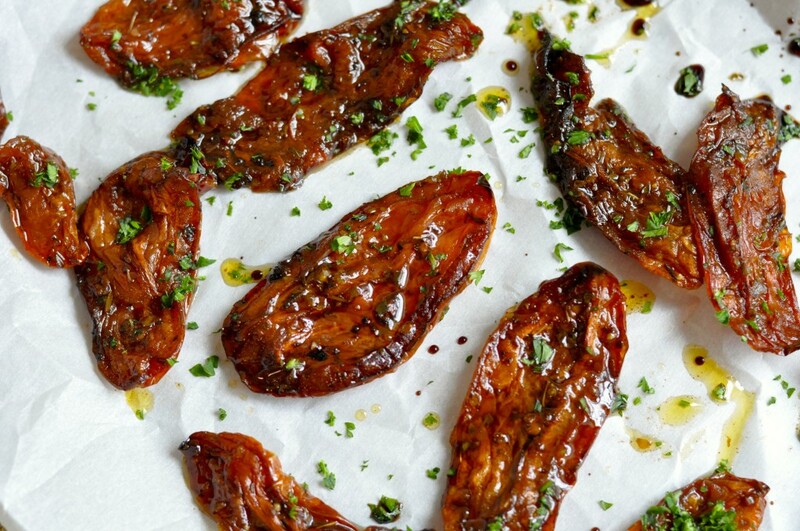 I know you’ll love these about as much as you love the bacon jam. Oh, add some freshly chopped oregano, basil and a wee bit of fresh rosemary to make these even MORE amazing!! Oooh… Really, this is bacon jam level? In that case I may have to try sooner than waiting for my garden fresh tomatoes! Yes! This is totally Bacon Jam level (especially if you add those other fresh herbs that I mentioned in my first reply to you!) 🙂 Enjoy them, Kris! !